I’d assumed this would be a pre-defined route (as per PPL Dual Nav’s), but it turns out that the night dual nav. is done by letting the student plan the route. Usual restrictions allowing, you can go wherever you like as long as it meets the rating requirements of being a 1 hour flight and greater than 27nm (50km). I’ve no idea how you fly for 1 hour and not cover 27nm, but I assume the distance criteria is there for a good reason – perhaps to push you out of visual distance of your home airport? Turning up to the aero club on an amazingly clear sky evening, my wife asked what I thought the chances of going flying were? 100% I replied confidently, not a cloud in the sky, not a gust of wind in the air. Time to be reminded that there is more that can stop you flying then the weather! My instructor came out, doing his best to hold back from coughing. It doesn’t take an Air Medical Examiner to know when someone is either about to come down with a cold, or is recovering from one – oh dear, this could end more rapidly then I’d expected and for reasons I’d not even considered. I just had to put the wind calculations into my flight plan, so while I did that the instructor went to get a hot drink and assess how he was feeling. While doing this a friend turned up and asked what I was up to and what route I had planned. Already having a night rating he was just playing with ideas of where to go/what to do himself. Going down to Cranfield was out because they had a runway lighting problem. On my instructors return I awaited that slightly awkward but understandable moment, where an instructor brings themselves round to finding the right words to cancel the lesson. Instead a discussion started on what the objective of the lesson was and where I wanted to go. He felt confident he could cope with a gentle Navigation flight, so we were still on (just!). A quick cross-check of the routes headings & math and it was off the check the plane. I’ve flown out of runway 23 hundreds of times, normally going up to around 1,500ft straight ahead and then beginning a turning climb. I was already a little anxious in my mind about what Point Alpha (A14/M11 junction) would look like at night and if I’d recognize it. So when the instruction came to continue to fly straight ahead until 2,000ft (and thus increasing my forward/horizontal distance). This really threw my orientation. I’d only been in the air a few minutes and already I was feeling lost, with none of my usual visual references to fall back on and at night the other good fixes like wind farms and railways can’t be seen. It’s easy to write down good sensible flying advice in hindsight and it seems obvious to read such advice back, but it’s amazing how easy the brain gets fixed on a problem and won’t let it go. It felt a bit stupid, but it was time to admit I was struggling. What Runway did we take off on?…………Where is Point Alpha relative to that? ………..and what heading are we flying now? Simple things! Really simple questions from the instructor and my starry night haze of confusion cleared away. We took off on Runway 23 (so heading 230 degrees), Point Alpha is north from there, yet we were heading 280-290 degrees. Clearly not north! So the road I was trying mentally very hard to “fit the map” was not the A14 but was in fact the M11, perhaps if we turned right and headed north we’d fine the A14/M11 junction. What a nightmare, I can fly a plane really!!! Embarrassing first night nav error out of the way and with Point Alpha now visually out of the window (I was worried it wouldn’t be that obvious – turns out it’s pretty blatant! ), now I could settle down and just crack on flying the plane. As I’ve mentioned before, there is a lit mast near Sandy, if you keep that on your left then this leg is pretty easy and you’re heading for a massive town of light so there’s not much that can go wrong. The lights of Bedford were ahead of me, the red beacon of Sandy was on my left, St. Neots on my right. Everything out of the window was where it should be and looked level, but the Artificial Horizon/Attitude Indicator (AI) was wandering as if we were beginning to roll right. Slightly instinctively I put some left aileron on to bring the wings ‘level’, but that made the picture outside start to look wrong. Weird. As the minutes rolled on the AI continued to show increasing roll, now suggesting I was in a 10 degree turn. I don’t think so, something has died on the instruments. For the AI to give up, your first thought would be to check the suction, because the attitude indicator is driven from a vacuum air-driven gyro (and the vacuum comes from the suction system). No suction, no vacuum, no gyro – so no Attitude Indicator. Yet, when you lose suction, the AI typically just falls over and ‘dies’. If the suction system goes you’d also expect to lose other instruments, like the heading/direction indicator. The suction gauge suggested we had good suction and the heading indicator seems to be happy. Once over Bedford it was the normally simple matter of making a turn, typically in level flight of 30 degrees, on to my new heading to go generally north east back towards Ely. Simple except without the AI, the rate of turn cannot be measured the typical way. So instead I used the Slip indicator which has a rate of turn indication which will show what is called a “Rate One” turn, on a Cessna 172 this is an ~17 degree turn. I let my instructor know that this was my intention, just to ensure he was aware, as otherwise my turn would look really gentle and might have raised questions. Though he knew we had no AI, so performing a rate one turn seemed like a fairly obvious fall back position rather then just guesstimating a 30 degree turn. With the turn complete and a quick check of the direction indicator against the compass – just to be sure that was still working and I hadn’t just rolled out at some completely bonkers heading. It was observed that the direction indicator was still working fine and strangely that the attitude indicator was now apparently working again. Strange. Leave Cambridge DME set up. More and we were too far left, less and we were too far right. To reassure my instructor I wasn’t just making stuff up, I talked in through the above scheme and thus I was confident I knew where we were. The other nice thing about this approach is that as you see the A14 approach you can correct your heading to line up with this known distance and thus put yourself on course. A much quicker solution then using a VOR/DME to waste 2 minutes finding out where you are. Then realizing you’re 2 miles off track and only then being able to correct it, by which point you’ve passed over your reference point and are chasing the navigation. Anything you can do on the ground to reduce your work load in the air, is worth doing! All that was left to do now was call up Lakenheath Approach and see if the USAF worked weekend evenings. As it turns out, on this particular night, they did. They gave us a MATZ (Military Aerodrome Traffic Zone) Penetration approval, and instructed us to Squark 0451. You can see I scribbled the code down at the top of my PLOG, I’ve come to expect Lakenheath to tell you to squark a code and I’ve had one or two run in’s with them where I’ve found I forgot the code about 3 seconds after they said it, so I now have pencil in hand before I call them up. I’d planned the route hoping that Ely Cathedral would be lit up at night with fancy up-pointing lighting that you sometimes see now outside large churches and such like structures. It’s a really nice landmark in the day, so if it was lit at night (and I was sure I’d seen it from the ground with up-pointing lights) I imagined it’d look amazing from the sky. Sadly, not so much, it did have a couple of spot lights pointing up, but to see these you really had to know what you were looking for first 🙁 The Cathedral was basically a dark patch north east of the city, but you could just about make it out. Disappointing. The clock was ticking past 40 minutes flight time, we still had to get down to Newmarket, then back to Cambridge, land and park-up. This route should be almost spot on for a 1 hour nav, brilliant. The distance you can see at night can make you worry about your timings, I estimated it would take us 5.5 minutes to get over Newmarket, but as soon as we’d turned I could see the lights of a town that unless our heading was wrong had to be Newmarket. This felt a little disorientating because it just seemed incredibly close and yet we still had 4 minutes to run. Working through a FREDA check (Fuel, Radio, Engine, Direction, Altitude) which is always a sensible thing after a turn I shined a torch on the compass just to make sure my heading indicator hadn’t lost the plot – as the attitude indicator was again giving up, there was a real risk of losing this as well. The compass reassured me I was on the heading I wanted, we’d just flown over the Cathedral of Ely so we couldn’t be a million miles away from where we wanted to be and sure enough as the minutes ticked by we steadily approached Newmarket and the Dead Reckoning all came good. Finding runways at night is a similar skill to finding them in the day, in that you first need to have a general idea of what to look for. You might think spotting a 1 mile piece of concrete in the day is easy, go have a trial flight and see for yourself, it’s not as obvious as you’d think until you know the lines/features that tend to surround them. Spotting the same thing at night, at any other angle then straight on for final approach is even harder. The omni-direcitonal runway lights mean that from almost any other direction the runway “disappears” into the darkness. We joined left base, this saved all the cost of doing a big standard over head join etc. and was partly why I’d routed the way I had to come back in from Newmarket. Lined up and coming down nicely on final approach everything was looking great for an on the numbers landing. At around 50-60ft I realised the runway still seemed very dark and I was getting no reflection from it via the landing light – that would be because the landing light isn’t on then! 🙁 I kept flying the plane and said “ahh my landing light isn’t on”, it was too late for me to go reaching for it, the instructor got there but we were so low it became a landing without the landing light, equating to a bit more of a thud then I’d like but nothing to get excited about beyond the to be expected comment about the light being on the checklist. Caught up with the friend who’d asked about my route at the start, turns out he thought it looked so good he’d go and fly the same route himself and had essentially ripped it off and been flying about 10-15nm ahead of us. So I’m sure RAF Lakenheath loved me for sending two Cessna’s into their MATZ. The risk of the weather compromising my ability to finish the Night Rating is now greatly reduced. All that remains is circuit work, I need to complete the list of failures/emergencies (i.e. 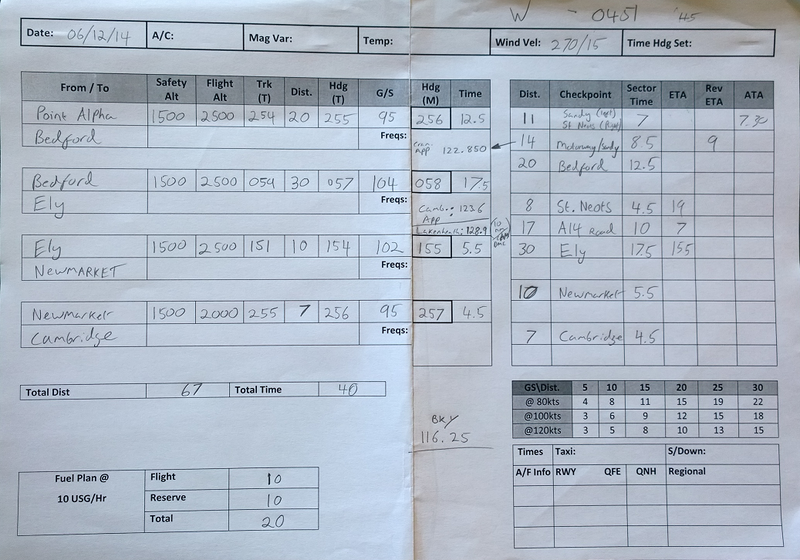 total simulated electrical failure) and complete 5 solo full stop landings. So watch this space! This entry was posted on Monday, January 12th, 2015 at 8:25 am by PHC	and is filed under Night Rating, Post PPL. You can follow any responses to this entry through the RSS 2.0 feed. You can leave a response, or trackback from your own site. 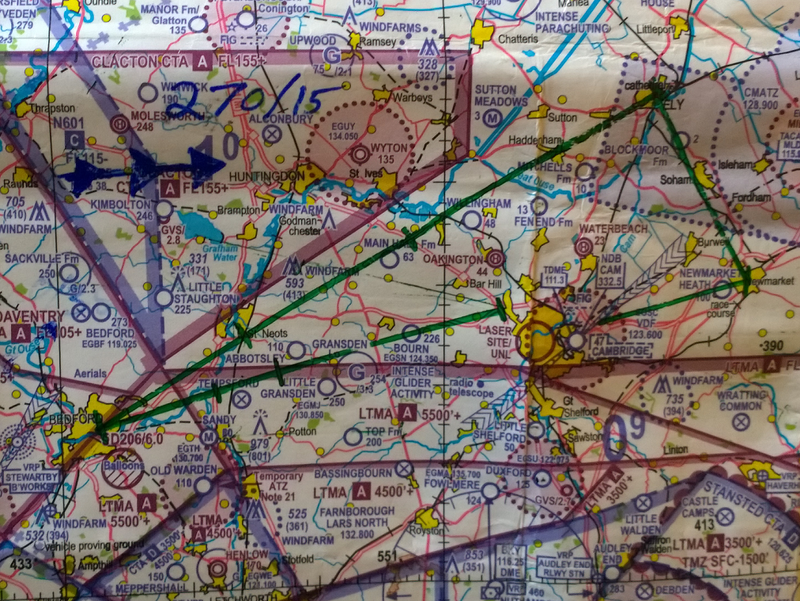 Nice route – I’ve also found Lakenheath rather accommodating, but very busy. Was pretty special to get asked to climb to 3000 to avoid the F16s doing circuits! Short suggestion for the total electrical failure – get a red head torch. I had a standard red one, and it’s tricky to put it in your mouth and start pointing at specific instruments one after another. Also, the flashes from the tower are pretty tricky to see. Even the tower is hard to make out, so worth trying to spot it on a previous circuit. See this is the problem with the fact I never quite manage to fully keep up on here, with my actual flying. By the time the posts appear and the suggestions come in, I’ve already flown again 🙂 I’ve now finished my Night Rating, but not had chance to write up the last two lessons. If you see my post on the Torch, my ‘solution’ (more by chance then by design I think) was to use one that’s low power mode is bright enough to illuminate the entire instrument panel (pilot side) in a gentle haze of red light, while just dumped on the chair. Seemed to work and keep the hands free to fly. Red head torch makes a lot of sense, you must have made it work ok but without trying it, I find myself wondering how hard it was to find, get on etc. ? Congrats on the Night Rating – I suspect by the time my paperwork comes back from the CAA it’ll be just in time for summer, night will be a distance thought and I’ll be back to Farm Strip flying. However, I’m hopeful a night rating will extend the season this year a little (departures, not landings 🙂 ).